This is a guest post by Colin Thomas. You can find more helpful eczema and allergy-friendly posts by Colin over at Eczema Cream Hub. As with most families with eczema and allergies, we would generally agree that preventing an eczema flare-up or an allergic reaction is better than treatment. It certainly pains us to see our children having to endure such an episode. With so many variables in the environment, it can be difficult to control what we come into contact with outside. 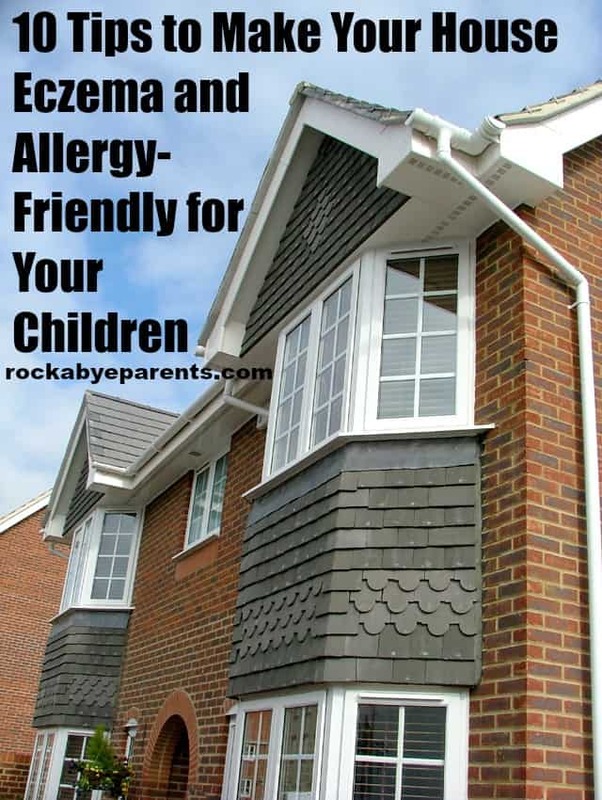 However, there are so many things that you can do to make your house a more friendly place for children (or even other family members) with eczema and other allergies. Since we spend a good amount of time at home everyday, it probably makes a lot of sense to start with what we can change and control. Let us explore the list of some of our best tips to make your house eczema and allergy-friendly for your children. Hot, humid weather in the summer not only triggers eczema, it can also turn your house into an ideal breeding place for mold and dust mites, which are also potential triggers for hay fever and asthma. Turn on the air-conditioning to cool things down a little, and maintain the relative humidity between 35-50%. Eczema skin may be more prone to drying in colder weather, thus it will be ideal to keep enough supplies of moisturizers and apply generously on your child’s skin after their bath. If any of your family members develop cold hives in the winter, you should adjust the central heating to a comfortable temperature and use a humidifier to keep the relative humidity levels stable. Dusty houses can be a real problem for household with allergies. You should be looking to set up a weekly cleaning routine where you vacuum and damp-mop the flooring at least once a week, and using a microfiber cloth (preferably damp) to clean other surfaces on a regular basis. The vacuum cleaner should ideally have a high-efficiency particulate air (HEPA) filter which will help to trap all the small particles. Depending on your house’s layout, it may be a good idea to use the accessories such as the crevice tool for cleaning those areas that are hard to reach. Don’t forget to wash or replace the filters in your vacuum cleaners, air-conditioners, central heating and cooling systems at least once a month. Fabric upholstery can be magnets for multiple allergens. Some synthetic fabrics may also be rough and prickly and trigger an eczema flare-up. You can consider buying non-upholstered furniture such as leather sofas and couches, wooden or plastic chairs which are also easier to clean. However, if you still love your fabric couches then remember to run a HEPA vacuum over them during your weekly cleaning. Those stuffed animals that your child drags all over the house attract more dust mites and other allergens than what you can imagine. For starters, keep just a few of your child’s favorites around their bed and keep the rest away in plastic containers. Wash them at least once every month and dry them under the sun in summer, or you can just leave them in a hot dryer for 15-20 minutes to kill the dust mites. Random clutters of items are huge magnets for dust mites and allergens to gather on them, in between, as well as underneath it all. Removing all these clutter not only keeps your home organized, it will make your weekly cleaning a breeze. Consider using clear plastic containers to store your stuff, and stack them neatly on some shelves or in your storeroom. It would be a great idea to replace wall-to-wall carpeting with other types of flooring such as tiles or hardwood as carpeting traps dust. You can consider using small pieces of rugs to reduce the likelihood of these trapped allergens. If replacing the carpeting is out of the question, you will have to use a vacuum cleaner with HEPA filtration to remove as much allergens on a weekly basis. In our efforts to get the house as clean as possible, we use many types of household cleaners. Many of the common household cleaners contain some form of harsh chemicals which can aggravate or trigger symptoms in people who have allergies. Consider switching to green, environmentally-friendly cleaning products. Most of these green products are made from natural and plant-based ingredients, and there are no lack of options if you are looking for one. For those of you who like to DIY, you will be happy to know that making your own natural products with ingredients such as vinegar, baking soda, and lemon is really easy. We would reckon that this is one of the most important steps that you should take in making your house eczema and allergy friendly, and it does not just apply for your children. We spend a considerable amount of our lives sleeping, thus it would make sense to ensure that the bedding is conducive for sleeping. Choosing a 100% cotton bedding with higher thread count would provide a comfortable bed for you to rest well without causing any further irritation. We would also advise you to cover your pillows, mattresses, comforters and box springs in microfibre dust-mite-proof covers. As for maintenance, you should wash the sheets weekly in hot water, and throw them into the dryer at high temperatures for good measure. It may be common for some of us to have our pets sleep in our bedrooms, or even together on the same bed. If your child is allergic to pet dander, it would be a good idea to set up a pet-free zone such as not allowing the pets to enter their room or not allowing them onto upholstered furniture. Besides clearing the pet fur and dander around the house during your weekly cleaning routine, it is essential that you bathe your pets regularly to ensure that they do not carry much allergens on them. This is especially important if they are particularly active outdoors, and they may carry dirt, pollen and other external allergens into the house. The kitchen and bathroom are two areas in the house where excess moisture can be found due to our daily activities of food preparation and personal hygiene. Excessive moisture can be a conducive factor for mold growth. Besides wiping away the excess water, it would be a great idea to install an exhaust fan to remove the excess cooking fumes and moisture. As for the general cleanliness of these two areas, you can consider using green products to scrub and clean away the mold on fixtures such as the sink, cabinets and countertops, refrigerator, shower curtains and floor tiles. Find me on Facebook and Pinterest for recipes, crafts, Disney information, and lots of great family posts!